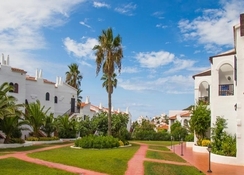 Carema Club Resort is a magnificent 4-star luxury resort ideally located in a beachfront location in Menorca. This family-friendly resort offers exceptional services, making it the best location for spending a lovely vacation. The resort features an outdoor swimming pool and an exciting splash park zone with pirate boats and water slides. For children there are many creative activities organised in the hotel’s junior club and mini-club and non-stop entertainment is offered for the whole family. The beach is only 50 metres away from the property, where guests can relax on loungers, play beach volleyball and can also take part in water sports such as Scuba diving. Apartments at the hotel are well furnished and equipped with all kinds of essentials. 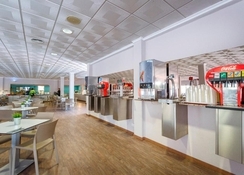 A 24-hour reception service is provided, and free Wi-Fi is available throughout the hotel. 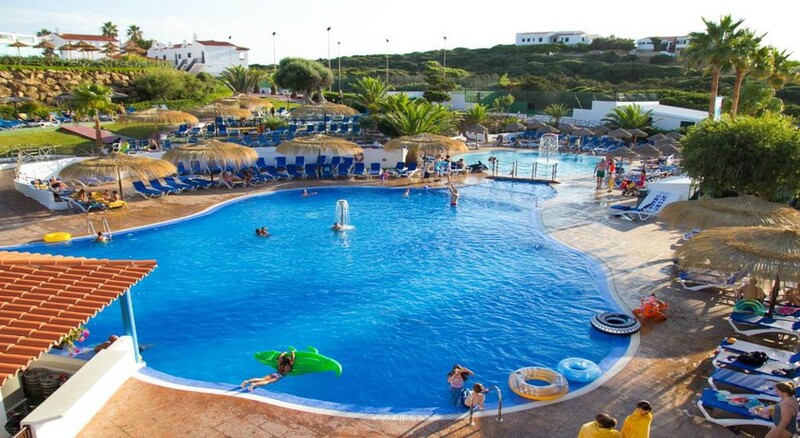 The hotel is located in Playas de Fornells on the beach Cala Tirant in northern Menorca. The beach is 50 metres away. The hotel is only 23 km away from the Menorca Airport. The beautiful town of Fornells is about 3.5 km from the hotel. All rooms at Carema Club Resort are well furnished with an attached bathroom and a kitchenette, and are fully equipped with air-conditioning; free Wi-Fi, satellite TV, microwave, kitchen utensils, refrigerator, cot (provided free on request) and room safe (can be hired). Rooms are categorised as: Standard rooms (can accommodate 3 adults and 1 child), Superior I rooms (can accommodate 3 adults and 1 child), Superior I rooms with sea view (can accommodate 3 adults and 1 child) and Superior II rooms (can accommodate 4-5 adults and 2 children). Superior sea view rooms offer beautiful views of the sea. Room services are provided for all rooms including cleaning 6 times a week, sheet changes once a week and towel changes 3 times a week. 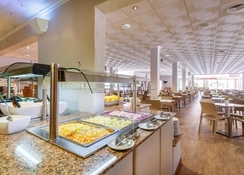 The Vistamar Buffet Restaurant at the resort serves a great variety of International and Mediterranean dishes. It also offers a daily cooking show, a pizza corner where fresh homemade pizzas of different flavours are served to the guests. The buffet meals can be enjoyed on the terrace with stunning sea views. The guests can also request a gluten-free menu. 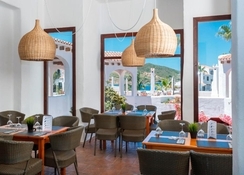 Also, there are two à la carte restaurants known as the Marlet Grill BBQ Steakhouse and the Marlet Playa for Mediterranean cuisine. The pool-side bar serves refreshing drinks and light snacks such as hot dogs and ice-creams. All-inclusive schedule consists of breakfast, lunch, dinner, snacks, drinks, ice cream and hot dogs. The hotel offers full time entertainment for all ages. The Carema Complex nearby the resort offers an outdoor swimming pool with sun terraces, loungers, parasols and a pool bar in the surroundings. There is also a splash park zone with three water slides and a pirates’ boat offering plenty of fun and adventure. 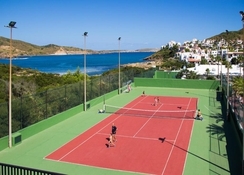 Sports and leisure activities at the resort include a tennis court, football and basketball in the multi-sports area. It also facilitates the guests with mini-golf, Ping Pong, bowls, wall climbing, beach volleyball and a gym. Daytime and evening entertainment programs are held for the whole families to sit back and enjoy. These programs are organized by a group of professional entertainers who also speak up to five languages (Spanish, French, German and Italian) so they can communicate efficiently with the guests and entertain them to the fullest level. For young children (4-8 years), there is a mini club, which arranges themed activities every day. The activities include shows related to environment, cooking, aliens and more. Grown up children (9-12 years) are welcomed in the Junior Club where they can participate in lots of creative activities, beach volleyball, mini-golf and much more.